Conner R., 2013 Manion's 'Cross, Day 1. 31 Dec 2013 - Final Kansas cyclo-cross race of the year today -- 'Cross Off the Old Year -- held again at Herman Laird Park, Shawnee, KS. Osceola Velo Club's Conner Rainey 2nd in Junior Men and 6th in Men's Cat 4, Pat Schlager 6th in Single-Speed. Here are a couple of photos of Conner R. in his Junior's race. Today's race was also the final race in the 8-race points series Series60CX. Final overall standings in 2013 Series60CX: Osceola Velo Club's Conner Rainey -- 1st Junior Men; Osceola Velo Club's Pat Schlager -- 1st Single-Speed! Very impressive, Conner and Pat! 29 Dec 2013 - Bitterly cold and windy for the Grote Prijs Shawnee today held at Herman Laird Park, Shawnee, KS. Osceola Velo Club's Conner Rainey finished 2nd in the Junior Men's race and then doubled up later in the afternoon to finish 6th in the Men's Cat 4 race. Pat Schlager finished in 6th in the Single-Speed race. Here are some photos of Conner R. in his Junior's race. And here is a photo link of Pat S. at the barriers. 26 Dec 2013 - Thawing conditions at the Boxing Day Cyclo-Cross held in Leawood, KS meant the course got sloppier and sloppier as the day went on. Osceola Velo Club's Conner Rainey finished 1st in the Junior Men's race before things got too messy, while Pat Schlager finished 6th in the Single-Speed race, the final, and muddiest, race of the day. Here are some photos of Conner R. at the stream crossing. Here is a photo link of Pat S. at the stream crossing on his first lap. 15 Dec 2013 - Mud, mud, and more mud at the New Longview Cyclo-Cross race held in Lees Summit, MO today. Osceola Velo Club's Conner Rainey managed to finish 2nd in the Junior's race (1st of the JR Men). Here are some photos of Conner R. Pat Schlager managed to cross the line in 5th in the Single-Speed race (final and most muddy race of the day) despite having to carry his bike the final two laps (5 KM) due to the mud clogging up his brakes and wheels. 08 Dec 2013 - Bronze Medal for Osceola Velo Club's Conner Rainey at the 2013 Kansas State Cyclo-Cross Championships in Junior Men's 15-16! Conner R. had a great race today in the very cold conditions at the Hummer Sports Park in Topeka, KS, chasing down and nearly overtaking his season-long rival in the two-up sprint for 2nd and 3rd in his age class. Osceola Velo Club's Pat Schlager finished 6th in Single-Speed. Here are some photos from today's State Championships. 01 Dec 2013 - A pair of podiums for Osceola Velo Club at the Epic Holiday 'Cross over in Parkview, MO. Conner Rainey finished 3rd in Junior Men and Pat Schlager finished 3rd in Single-Speed. Conner R. also finished 4th in Men's Cat 4. Nice racing, team! Here are some photos of Conner in his Junior race. 24 Nov 2013 - A couple of very cold days of racing at the Lost Trail Cyclo-Cross held at Cider Mill just west of Louisburg, KS this weekend. Osceola Velo Club's Conner Rainey 2nd place each day in the Junior Men, coming oh so close to overtaking his season-long rival in Sunday's race. Plenty of slips, contact, and falls by both racers on the partially frozen course. Great fun to watch. Pat Schlager finished 4th on Saturday and 5th on Sunday in Single-Speed. Here are some photos of Conner R. at Lost Trail. 17 Nov 2013 - Mild but very windy conditions in Wichita today for the Johnson's Garden Center Cyclo-Cross Race. 1st in Junior Men for Osceola Velo Club's Conner Rainey despite banging his left knee in a first-lap crash. Pat Schlager finished in 5th place in the Single-Speed Category. Here are a couple of photos of Conner R. at the barriers. 09 Nov 2013 - Podiums for both Osceola Velo Club's Conner Rainey and Pat Schlager at the Grand Prix HPT! Conner R. 2nd in Junior Men and Pat S. 3rd in Single-Speed in the season's only avondcross (that's Flemish for "evening 'cross") held under the lights around and on the dirt oval at the Heartland Park motor sports complex in Topeka, KS. Here are some photos of Conner negotiating the two stair run-ups, and here's a photo link of Pat on his final lap. 03 Nov 2013 - Another full weekend of cyclo-cross racing for Osceola Velo Club's Conner Rainey and Pat Schlager. Colavita Cup on Saturday and Boulevard Cup on Sunday held at different venues in Shawnee, KS. Conner R. finished 2nd in Junior Men on Saturday, 2nd in Junior Men on Sunday, then doubled-up and raced in the Men's Cat 4 Sunday finishing 6th. Very impressive weekend of racing, Conner. Pat S. DNF'd Saturday but bounced back to finish 8th on Sunday in Single-Speed. Here are some photos of Conner racing Saturday and Sunday. 27 Oct 2013 - Osceola Velo Club's Conner Rainey and Pat Schlager raced at the Boss Cross this weekend with Day 1 being held on the Missouri-side and Day 2 on the Kansas-side of greater Kansas City. The Boss Cross folks had a couple of challenging courses staked out, with Saturday's course more suited to mountain bikes than 'cross bikes, but that didn't stop the Osceola Velo crew. Conner R. finished 2nd each day in Junior Men, with Pat S. crossing the line in 5th on Saturday and in 8th Sunday in Single-Speed. Check out the photos of Conner. 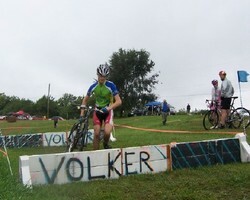 Here is a photo link of Pat racing at Boss Cross, Day 1. 20 Oct 2013 - Osceola Velo Club's Conner Rainey and Pat Schlager raced at the Joules 'Cross held just outside of Lawrence, KS at the Schwada Cyclo-Cross Field. Conner R. finished in 2nd place each day in the Junior Men's Race, while Pat S. crossed the line in 8th each day in the Single-Speed Category. Another great weekend of 'cross, team! Here are a couple of photo links of Day 1 -- Conner, Pat. Photo links of Day 2 -- Conner, Pat. 06 Oct 2013 - Two chilly, breezy days of cyclo-cross racing in the 360 Cup at Centennial Park, Lawrence, KS. Osceola Velo Club's Conner Rainey and Pat Schlager showed some consistency over the weekend with Conner R. winning the Juniors' Race and Pat S. finishing 8th in Single-Speed Category each day. Check out the photos of Conner at Centennial Park. And here's a couple of photo links of Pat -- Day 1, Day 2. 29 Sep 2013 - The 2013-2014 Kansas Cyclo-Cross Season is upon us! Manion's 'Cross, held in Wyandotte County near Kansas City, KS, started things off this weekend. The weather Saturday was true 'cross -- rainy, turning chilly, becoming very muddy, while Sunday's races were held under calm, sunny, and warm conditions. Osceola Velo Club's Conner Rainey raced his first 'cross races this weekend and showed a natural ability for adapting to the variable weather and course conditions to finish 1st on Saturday and 2nd on Sunday in the Junior Men's Race. Pat Schlager spent most of his race Saturday running the course due to the increasingly muddy conditions but was able to ride even the steepest hills (at least during the first two laps) on Sunday. Pat S. finished in 11th place each day in the Single-Speed Race. Check out the photos from Manion's. And here's a couple of photo links of Pat at the ditch on a soggy Saturday -- photo 1, photo 2. Great start to the 'cross season, team! 24 Aug 2013 - Osceola Velo Club's Pat Schlager made the drive to St. Louis to race on the Penrose Park Velodrome during the Missouri State Track Championships. Despite being way undergeared for that track, Pat S. posted personal bests in the 500 M Individual Time Trial and Flying 200 M, and was listed in 8th in his Scratch Race. Nice "velodrome-ing," Pat. 21 Jul 2013 - Osceola Velo Club's Pat Schlager competed in four events at the Kansas Track Championships today held on the Lawrence Grass Velodrome. Pat's time in the 500 M Individual Time Trial was good enough for 3rd in his age group thus earning Pat the Bronze Medal. Here is a photo link of Pat in his Bronze Medal ride. Way to go, Pat! 30 Jun 2013 - Osceola Velo Club's Pat Schlager raced all three days in this year's Tour of Lawrence -- the uniquely formatted Street Sprints (200 M from a standing start, drag-race style) Friday evening, the hilly KU Campus Circuit Race Saturday, and the speedy Downtown Criterium Sunday. Pat S. finished as Lanterne Rouge in his category both Saturday and Sunday. 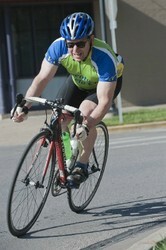 Here is a photo link of Pat in Sunday's Crit and some more photos of Pat in the Crit. Nice (long) weekend of racing, Pat. 21 Apr 2013 - Osceola Velo Club's Pat Schlager flew the club's colours this weekend at the VeloTek Grand Prix, the state's only time-based stage race. Pat S. raced in all three stages -- a short uphill Time Trial, a rather flat (but windy) Criterium, and a very hilly (and very windy) Road Race. Here's a photo link of Pat in the Time Trial, and one of Pat in the Crit. 30 Mar 2013 - Osceola Velo Club's Pat Schlager was on hand for the final race in the 2013 Spring Fling Criterium Series at Clinton State Park. Not quite as cold, but still not very Spring-like for the Masters' race around a shortened, and therefore, faster course. 23 Mar 2013 - Another Spring Fling Crit today in non-Spring-like conditions with Osceola Velo Club's Pat Schlager listed in 16th in the Masters' category. 16 Mar 2013 - The pre-season Spring Fling Criterium Series continued today with it's 3rd race in very non-Spring-like conditions out at the Clinton State Park near Lawrence, KS with Osceola Velo Club's Pat Schlager racing in the Masters' category. Here is a photo link of Pat S. racing in the cold. 03 Mar 2013 - Osceola Velo Club's Pat Schlager was on hand for the first race (of three) of the Perry Road Race Series held along the dam and spillway roads of Perry Lake, KS. It felt odd to Pat S. to be road racing with snow still on the ground, but that didn't stop Pat from crossing the line in 12th in the Masters' race. Here's a photo link of Pat making his way along the "false flat" of the finishing climb. 10 Feb 2013 - Final cyclo-cross race of the season, Wintery Mix CX #2, once again held in Leawood, KS. And once again, Osceola Velo Club's Pat Schlager finished 5th in the Single-Speed Category. Mild temperatures, but very windy conditions, with overnight showers leaving the coarse soggy in places and very muddy at the "old creek bed." Here's a photo link of Pat S. picking his way through some Cat 4 racers on the opening lap and one of Pat seeking the least muddy path through the "old creek bed." 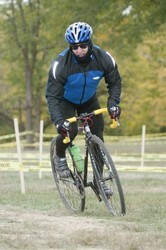 06 Jan 2013 - Osceola Velo Club's Pat Schlager 5th in Single Speed at the Wintery Mix CX #1 race held in Leawood, KS. Another thawing day saw the Single Speeders race in the sloppiest of conditions. Here's a photo link of Pat S. giving running through the muddy "old creek bed" a try early in his race (Pat rode it during the final two laps). Only one more race to go in the 2012-2013 Kansas Cyclo-Cross Season. Pat S., 2013 Tour of Lawrence Downtown Criterium. Stock photo of Pat S.